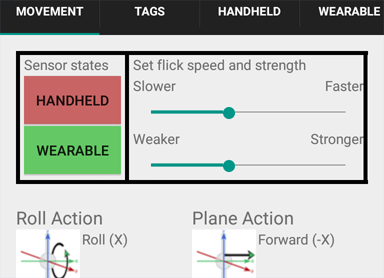 On this page we are going to cover the steps to follow in getting FlickStart operational on your phone and Android wearable. The Androidwear part of FlickStart will automatically be copied to your watch, but the process can take longer than you might expect. Allow around five minutes. If nothing appears after some minutes, try uninstalling FlickStart from the phone and re-installing it. When FlickStart reaches your watch it should start (if not, please start it). Then FlickStart will communicate with the phone and download the tags that have commands which are triggered by the motion sensor in the watch. 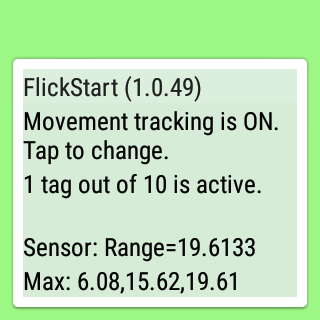 The FlickStart app immediately after install starts up with the motion sensor on and a set of commands already activated. This initial configuration makes it easy try some moves straight away and get a different sound as feedback from each successful move. Tapping on this screen alternately turns the sensor on and off. You should tap the sensor button to make it go green when you want to start using FlickStart, and tap it to make it go red when you have finished using FlickStart.